THRESHOLD CARE is a non-profit group in New England providing education and consultation services on topics including death midwifery, home funeral and green burial. 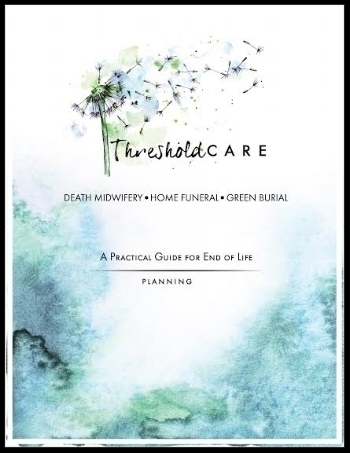 THRESHOLD CARE has authored a Planning Guide, an easy to follow workbook which can be used to initiate conversations and document wishes for a peaceful end of life transition. This guide is available for purchase online. Threshold Care hosts educational community events, movie screenings, and lectures designed to bring people together to learn about and openly discuss topics related to death and dying. Are you interested in having Threshold Care present at an event or symposium?